Manufacturer of a wide range of products which include automatic mobile tower light, mobile lighting tower, lighting tower and mobile tower light. 1 Diesel Generator • EA 5 G1. • 3Ph. Cooled Silent DIESEL GENERATOR Set comprising of Kirloskar Green Engine Model EA 5 G1 coupled to Kirloskar Green 5KVA. • Three Phase Alternator mounted on the common base frame along with standard accessories. • Insulated Sound proof Canopy and Latch door Control Panel. 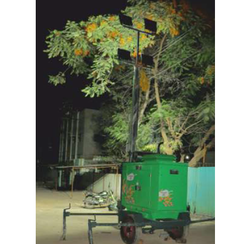 4 Lighting System • Make: PHILIPS/BAJAJ/CROMPTON 500 Watts metal halide lamps. • Leaf Spring and coil type Suspension System. • Heavy duty automobile Common axle. • Three Phase Alternator mounted on common base frame along with standard accessories. 8 Lighting System • Make : PHILIPS/BAJAJ/CROMPTON 400 Watts metal halide lamps. 1 Diesel Generator • EA 10 G1. • Cooled Silent DIESEL GENERATOR Set comprising of Kirloskar Green Engine Model EA 10 G1 coupled to Kirloskar Green 10 KVA. 8 Lighting System • Make : PHILIPS/BAJAJ/CROMPTON 1000 Watts metal halide lamps. We are offering Mobile Tower Light to our clients.